Check out the YouTube video of the unboxing HERE!!! 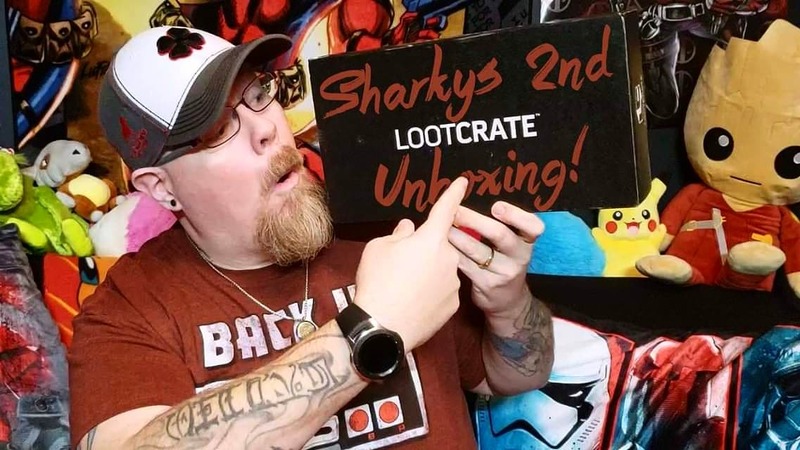 So my 2nd Loot Crate arrived on February 5th but it’s actually the January Loot Crate…they seem to be pretty crappy with the shipping and I still don’t like how the box just comes like that- black with LOOT CRATE on it- pretty easy for folks to know what is in there and steal it. Plus, the way the USPS is- it’s surprising one of the 2 boxes hasn’t been destroyed- this one was ripped a little bit but nothing major. 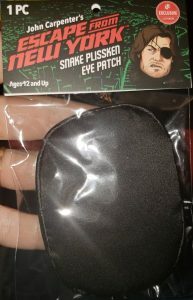 First up was the Escape from New York Snake Patch that was missing from last month- not much to see..just a patch really. Next up was a pair of socks from the TV show FRIENDS- I did like that show and watched every episode but it was thanks to Jennifer Aniston- the show was OK but she is amazing. 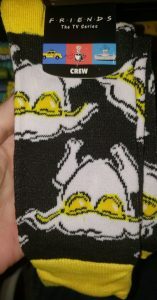 The problem with the socks is that they are from the Thanksgiving episode and have a turkey on them…and it’s 10 months until Thanksgiving! These should have been in the October box- which you would have gotten the first week of November. 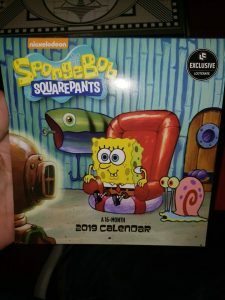 And on the subject of items that should have been in previous box, the next thing up was a Sponge Bob calendar- sure, I like Sponge Bob- not a huge fan but, it’s a sponge…what’s not to love? The problem is that it’s already February so there is an entire month of the calendar you can’t even use! 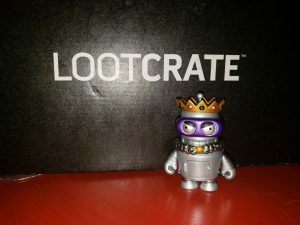 It is a “Loot Crate Exclusive” and it’s got some cute pics and special “days” highlighted- we put it in our sons room so it’s not a total waste. 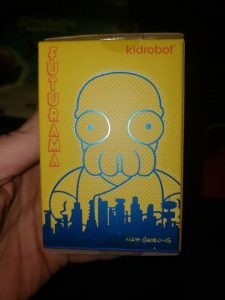 They usually have some type of toy and this month was a Futurama “blind bag” type thing- I’ve seen the show several times but never a huge fan- just enough to know the characters and some of the story lines- thankfully I got the coolest one in the set- the exact one (and ONLY one) I would have wanted- can’t complain there. KING BENDER!! The last couple of items were from Black Mirror and I LOVE Black Mirror- it’s one of my favorite shows and they really did a great job with the pin and shirt. 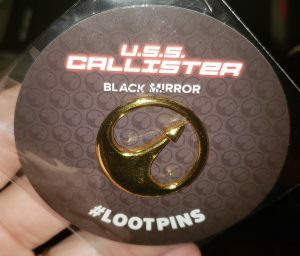 The pin is from the “USS Callister” episode which was amazing and the shirt is all black- even the logos. It’s hard to tell by the pictures but those logos are almost as black as the shirt. There are 6 logos- each from a different season and episode. 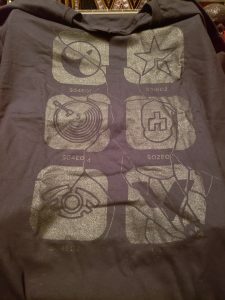 I’ve seen a lot of people complaining about the shirt but I think it fits Black Mirror perfectly. The pictures are hard to see- almost like they are hidden so it just goes along with the shirt and I really like the shirt. 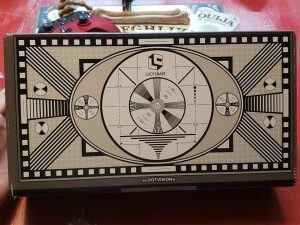 And finally- the box turns into an old TV looking thing that you can scan and unlock digital loot- only problem is- the app isn’t on ANDROID!!! SO that was a waste- still cool little box. This month was WAY better than last month but I still don’t think it’s worth $20- it’s great for me because I got the Black Friday deal so I only paid $10 per box and that’s a good deal. If the boxes don’t get better over the next 4 months, I’ll probably cancel my subscription and find another monthly type box to review. Come on back during the first week of MARCH and see what we get in the FEBRUARY box…makes total sense!